The Nokia 500 comes with a fully functional phonebook, which can easily be synced with your exchange account. 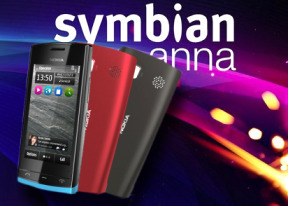 Symbian has been offering users virtually unlimited phonebook capacity and excellent contact management for quite some time and now the Anna also improves the SNS integration to bring it more up to date. We didn't experience any call-related issues with the Nokia 500. Reception is solid, voice quality good on both ends of a call. The earpiece is loud enough and there were no interferences whatsoever. Voice dialing is available on the 500 and gets activated by pressing and holding the call key on the home screen. It is fully speaker-independent and as far as we can tell performs greatly, recognizing all the names we threw at it. The 500 has the usual accelerometer-based feature that lets you mute the ringer by turning the phone face down is present. That same turn-to-mute trick also works for snoozing your alarm. The Nokia 500 lacks active noise cancellation, though. The Nokia 500 sat our traditional loudspeaker test. The phone did well there and the Good mark it snatched means it should be loud enough for nearly every situation. More info on the test, as well as other results can be found here. The Nokia 500 can easily cater for all your messaging needs. All your incoming messages arrive in a common inbox. If you like, you can also get them sorted as conversations, in threaded view. The Nokia 500 relies on a shared editor for all the types of messages. Stuff like a character counter in SMS goes without saying. The Nokia 500 email client allowed us to setup our Gmail account quite easily, including syncing the account as an Exchange Active Sync one so that we'd get all our contacts. Usually, all you need is to enter a username and a password and you will be good to go in no time. The Active Sync setup required a few manual settings though and we believe Nokia should do something about it. Multiple email accounts and various security protocols are supported, so you can bet almost any mail service will run trouble-free on your Nokia 500. With Anna, the Symbian portrait QWERTY keyboard has split screen support, meaning the top half of the screen is left for the app, while the bottom part is for the keyboard. The keys on the portrait QWERTY are a bit small, despite the available screen estate. Still, you can activate word prediction, which will guess the word you're trying to type and show a small popup with the word you actually typed, in case you're trying to enter something like a user name (which doesn’t have to be a valid word, in fact word prediction in this case gets in the way). This eliminates the annoying situation of taking you out of the app and into a text edit screen and then back to the app (entering URLs in the browser and using the URL autocomplete was the most painful example). Also, you don’t have to change orientations just to use the QWERTY keyboard, which was mightily annoying. Still, it's not perfect - several apps would popup the old text edit screen, obscuring the app even though we were using the portrait QWERTY. The Ovi store app is an example of where that happens, which was a little disappointing.